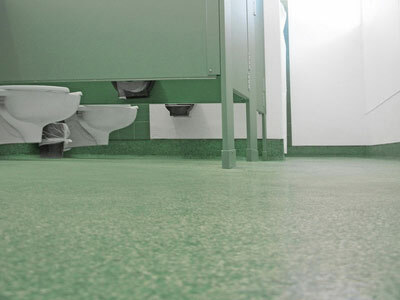 Everlast® Floor has a textured finish. It is made from small natural marble stones and quartz which give it texture. This makes it a slip-resistant floor. 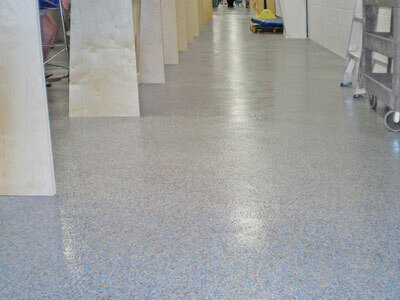 It is a resin-rich floor, meaning the stones are completely saturated in epoxy resin, which makes it non-porous and therefore easy to clean. Clean your floor using detergent and water. Dirt and grime are easily removed because the floor is non-porous. 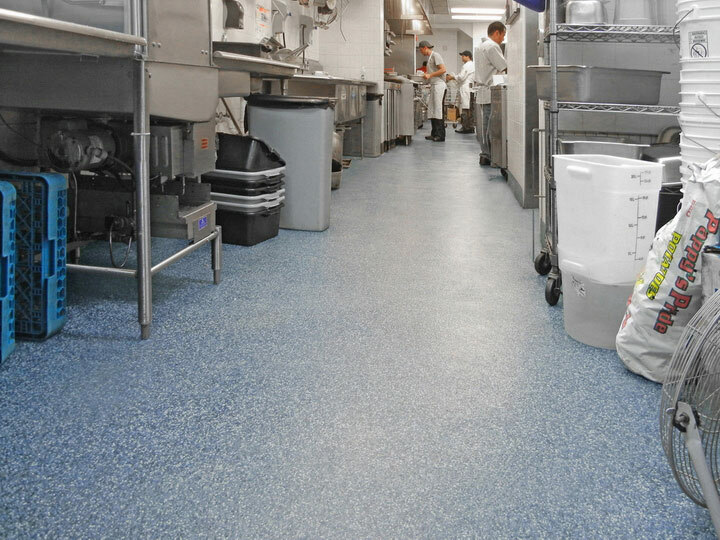 In foodservice, medical or restroom areas where the floor is exposed to chemicals we recommend washing your floors with a deckbrush and rinsing off the washwater thoroughly on a daily (or nightly) basis. Everlast Floor can also be pressure washed if necessary. Never scrub your floors again!!! First, remove excess water with a squeegee. Sprinkle Everlast Floor Cleaner over the floor and then spread it around with a deck brush to ensure complete coverage. Let it sit for the amount of time recommended by the cleaning solution manufacturer. 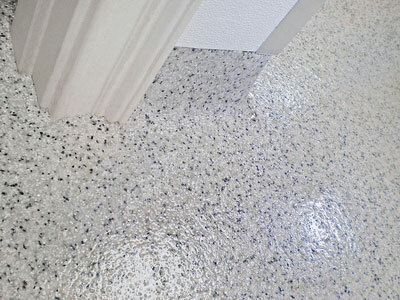 Because of the properties of your Everlast Floor, dirt and grime will begin to "bead up" making it easy to remove. Using a deck brush, agitate the cleaner to dislodge the dirt and grime from the floor. Chase the now dirty cleaner off the floor with fresh water and a squeegee. This will ensure your floor will still look like new for years to come. 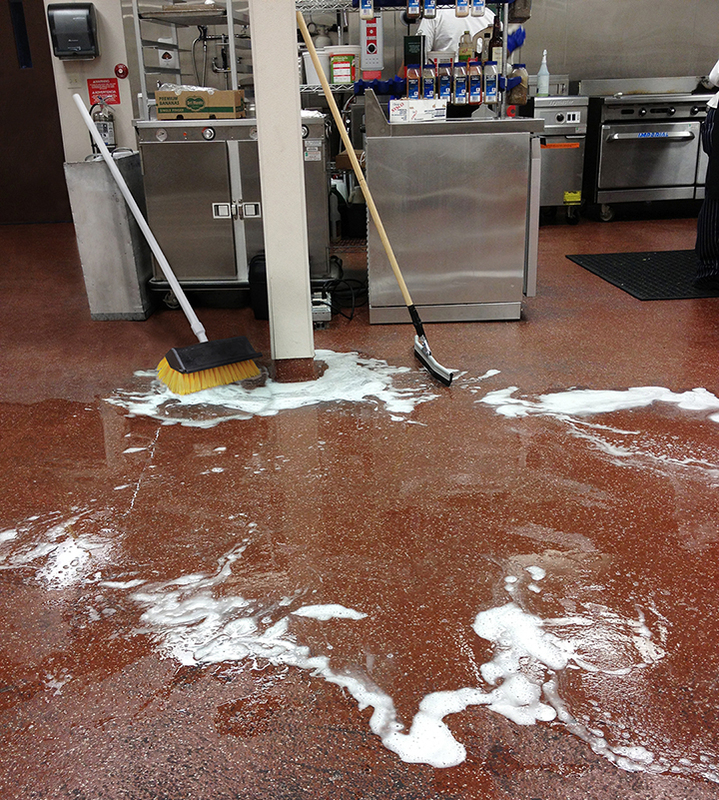 When maintaining a "back-of-house" (restaurant kitchen) floor, it is important to extract the standing rinse water nightly. This ensures your floor will last for years as some foods have acids that, when left for weeks without cleaning, can damage your floor. This can be done either by pushing the water to the drains with a squeegee or with an extractor when the floor is flat and does not have positive drainage. Please contact us or visit www.everlastepoxy.com/clean for recommendations on the best cleaning products available and for power extractor recommendations.